Live goblin shark Mitsukurina owstoni, from here. Takahashi, N., & N. Yuasa. 2012. First recorded use of weaponised light by an elasmobranch. National Daiei Journal 7: 17-87. Photo of the new shark species from Takahashi & Yuasa. Close-up of the head of Neomitsukurina nodai, from Takahashi & Yuasa. The photophore contains a unique lens structure that focuses the light it produces. So strongly focused is the light, in fact, that it can be used in prey capture by the shark. Through a mechanism not yet fully understood, but possibly a shock reaction to its brightness, the light causes potential prey animals to become stunned, after which they can be easily picked off. Preliminary observations of Neomitsukurina suggest that it may be willing to take on quite large prey: even turtles have not proven immune to stunning, though the shark did not always immediately ingest stunned prey animals. Neomitsukurina has also been observed gliding above the surface of the water through the use of its enlarged pectoral fins. It might be wondered how such a distinctive and mobile predator eluded discovery until the present, but Neomitsukurina's strict nocturnality might have something to do with it. It is also worth noting that sightings of what may, in hindsight, have been Neomitsukurina have been described in the past (a particularly famous sighting occurred in 1971, near the island of Niemonjima), but attempts to follow up such records have so far only collected other animals such as sea bass. Sharks with frickin' lasers! Yeah! hands down, the best April fools' ever. period. I'd love to see the development that led to the extremely anteriorly placed and rotated branchial region. Maybe it has something to do with the unusual ventral flexation of the head as illustrated by the holotype. Keen! Can a new turtle species be far behind this discovery? What's with the pectoral fins, by the way. Those look like something you'd expect to find on an iniopterygian, but the mobile lower jaw throws the hypothesis that this species is a late surviving basal holocephalian out the window. 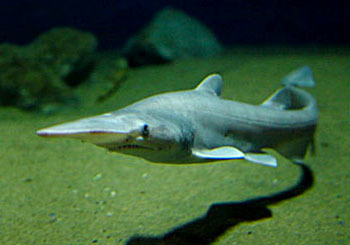 It could be a eugeneodontiform, as based on the long snout, but some have suggested that eugeneodontiformes had fused upper jaws as well. The dorsal "fins" are obviously the remnants of an anguilliform tail though. I'd like to thank(?) you for reminding me of my cluelessness wrt popular culture. The dorsal "fins" are obviously the remnants of an anguilliform tail though. When I first saw the video, my immediate thought was that they looked remarkably like a sturgeon. Looking at the stills, though, I'm not so sure. Andreas: Don't worry, this one was never popular. The picture of the live shark looks nothing like the skeleton with a large, rubbery-looking proboscus. Really?? Remarkable case of life imitating art; in this case, the 1954 Disney Nautilus: http://www.naturecoast.com/hobby/nautilus.htm. I'd like to see the paper, the images seem quite fake... Beeing true, it's amazing. if this is a actual shark that is awesome but if not that's messed up, but that other person is right it looks like, they are a drawing or a photo was messed with. As a 3D Artist, I can clearly see that this is a 3D Model and not a living creature.